ERIN ZIRCHER, JANE STODDARD, and CARLOS HIDALGO are the founders and partners of CRU Oyster Bar. 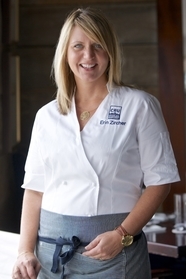 Erin is Executive Chef and one of the most celebrated chefs on the island. Her skills have been featured in national media including Saveur, Town & Country, Wine Spectator, and Cooking Channel TV. A cookbook that captures the laid-back, but elegant lifestyle of Nantucket and the wonderful dishes of its locals' and tourists' favorite CRU Oyster Bar.